Are you ready to go Tiny? We can help make your tiny house dreams come true. Having built my own 40ft gooseneck Tiny House on Wheels that I’m now living in (and loving! ), I understand the many different facets of the tiny house building process. I know what it takes to not only build and design a tiny house on wheels, but what it’s like to live in one and the particular needs and considerations that need to be taken into account for a successful tiny house lifestyle. I spent an entire year learning the ins and outs of building a tiny house from the ground up and the resulting (#TaHOW) tiny house on wheels that my girlfriend, 2 dogs and I now happily call home is proof it was time, money & energy wisely invested, paving the way forward for future tiny house dwellers and owners. That’s what separates us from a lot of the other tiny house builders – intimately understanding, living and breathing the full Tiny House on Wheels experience. I’ve been involved in the real estate world myself (from land development, building and construction, to finance and property management) for more than a decade (which is part of what led me to to Go Tiny & Be Free…). In this quest for a smarter, better living solution, I first developed and built a small subdivision of smaller “patio homes” – 2 bedroom, 1 bath homes under 800 square feet here in Huntsville, Alabama prior to discovering the Tiny House movement and going Tiny myself. So I understand the process of home building firsthand, and all the restrictions and limitations of traditional housing for which Tiny Houses on Wheels is a wonderful freedom-providing solution! My building partner Danny is a home builder who’s been developing land, creating housing subdivisions and building houses for over 30 years in the Huntsville, Alabama area, as both an Alabama-licensed home builder and general contractor (bonded, licensed and insured). Combined, we have the skills, talent pool, ideas, contacts, resources and experience to ensure your tiny house is safe, stylish, functional, efficient and just the way you want it. Here at GoTinyBeFree, we want to help you Go Tiny so you can be free – whatever free looks and feels like to you. We’re here to guide you and assist in any way that we can to help you Go Tiny. 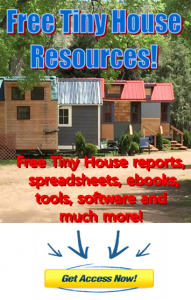 To begin the tiny house on wheels building process, start by filling out this questionnaire here.